The thing that I appreciate about war movies is that every story is a different one, and this movie is probably one of the best examples of that. Hacksaw Ridge is a retelling of the true story about a Christian young man named Desmond Doss (Andrew Garfield) who enlists in the Army during World War II as a field medic but refuses to kill anyone or even hold a rifle. It’s a premise that’s interesting enough, but I did have my doubts as to whether or not it could carry through a two-plus hour movie. It did so much more. The beauty of Hacksaw Ridge is not in its outstanding cast performances or shocking action, but in its reverence for the inspirational man who refused to compromise his morals. It’s a tale that fills a tall enough order by being entertaining and inspirational, while filling an even taller one by being a true story. Something that I appreciated most about this movie is that in addition to all of the cast members doing fantastically in the roles they’d been given, no one feels out of place or even stands out. Of course, Andrew Garfield plays the main character, and he plays the kind of person you can’t help but to root for. He’s perfectly cast for the role. Even when he’s not given any lines to work with, just his smile makes you feel like this is the guy you want to win at everything. Garfield is joined by several cast members who could have easily overshadowed him, but instead, they fell perfectly into the story. We see Hugo Weaving in a different light here than we usually do, and he totally makes sense in his role. We see Vince Vaughn out of his typical comedic element here, but while he does provide some levity to the story, he never feels out of place. Andrew Garfield is Desmond Doss in ‘Hacksaw Ridge’. 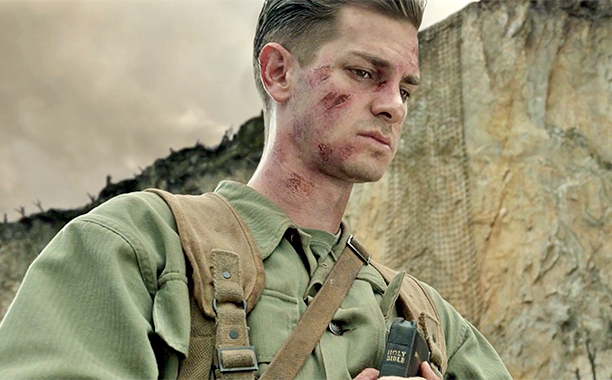 In addition to Garfield’s role as Desmond Doss, I thoroughly loved the way he was presented to the audience. In many cases in film, when you have a person like this who is fundamentally good-natured, it can be difficult to look at them as a relatable or compelling character. However, we’re given enough of Doss’s life story to understand his motivations behind his personal convictions, and as a result of this, he never feels like some other true-story movie heroes do: painted in nothing but good light. In Hacksaw Ridge, Desmond Doss is painted in the best light because we also get to see his internal struggles that got him there. My interest in Doss also shot through the roof when the movie finally drops him into a wartime scenario. I was vastly intrigued just with how he would react to the kind of violence that Mel Gibson was able to put on the screen. And that leads me to what I loved most about this movie. The thing that kept me the most invested in Hacksaw Ridge was the sheer inspiration of it all. For me as a Christian, that inspiration came from watching one of the best portrayals of a Christian in secular cinema play out in a Hollywood-scale movie. First of all, the character of Desmond Doss is an almost perfect representation of what all Christians strive to be. There’s never a moment when he comprises his beliefs, and everything he says about God and faith ring true in accordance with Christian theology. In its own way, this movie can also serve as a metaphor for Christians as to how we should be living our lives. I can’t say much more in regards to that for fear of spoiling anything, however. And if you’re not a Christian, there’s still a message about the triumph of the human spirit and self-discipline in Hacksaw Ridge for everyone to be inspired by. For the most part, the complaints I have about this movie are extraordinarily minor ones. While Mel Gibson shows great prowess in directing the brutal action of war, there were a few unnecessary shots featured in the movie that contained some lazy CGI work. It was an easily avoidable mistake that the movie made more than once, so I’d be remiss to not mention it. There were also a few scenes in the movie that I wish we got to see played out further. Perhaps extended versions of these scenes were not included for time purposes or perhaps there just wasn’t much more necessary content in them. Either way, it still would have been nice to get a bit more from these moments. Hacksaw Ridge is easily one of the top five movies I’ve seen so far this year, and it’s one that had me choked up on more than one occasion. When the movie ends and shows clips from the “where are they now” segment that all true stories have, you truly realize the gravity of what you just watched and how well the movie pulled off the true story. What did you think of Hacksaw Ridge? Sound off in the comments below, and if there’s another movie you want me to review, let me know!